The original St. Patrick's Church built in 1854 upon the present site of the Palace Hotel from materials brought around the horn. Moved to Eddy Street & served as pro-cathedral 1885 to 1891. Moved to present location 1891 where it became Holy Cross Parish Church until 1899 - one hundred years of service have been completed. The oldest frame church building standing in San Francisco. Originally constructed in 1854 on the south side of Market Street between Second and Third where the Palace Hotel stands today, it was the second church for the Parish of Saint Patrick. The third St. Patrick's Church is on Mission Street between Third and Fourth. 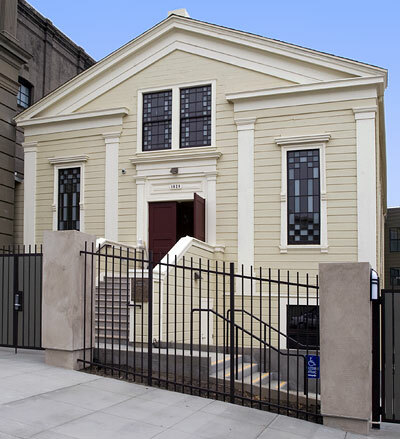 In 1873, the building was moved to Eddy Street, between Laguna and Octavia to serve as the church building for Saint John the Baptist Parish. 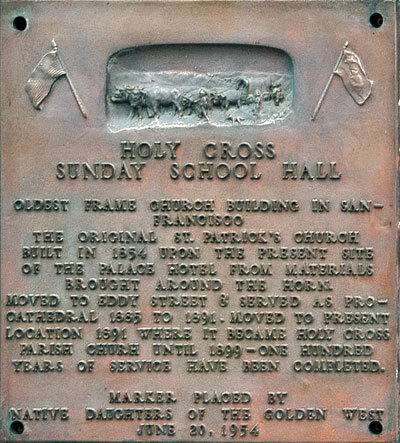 In 1891, it was moved to its present site to serve as the church for the Holy Cross Parish until 1899 when a new church was consecrated, and the old wooden church became the Parish Hall. Both buildings survived the 1906 Earthquake and Fire. The 1854 church and the 1899 church have been reincarnated as Buddhist temples.